Discussion in 'Gambling and Betting Forum' started by JimGunn, Jan 16, 2019. Found my first big bet of the card: Just re-watched Jairzinho Rozenstruik's most recent fight against Ukrainian heavyweight can crusher Andrey Kovalev at Rizin FF 10. Rozenstruik's head movement defense is terrible for an experienced kickboxer with a 5-0 MMA record- he got punched multiple times hard right in the face and head by Kovalev in round 1 in between delivering his own effective strikes and then was helpless on his back after getting taken down by Kovalev in round 2. He only won the fight by split decision because Kovalev tried a sloppy takedown in round 3 and ended up on the bottom and then got exhausted and tried other bad takedowns. Junior on the other hand has knocked out Timothy Johnson in the UFC and gone the distance striking on the feet with former UFC champion Andrei Arlovski. Losing by ezekiel choke to Alexei Oleinik has no bearing on this matchup. Albini has also never been knocked out or TKOed himself, which I think is Rozenstruik's only way to win this. Rozenstruik also got really tired at the end of round 3 in his Rizin fight. I'm backing the much more proven Junior Albini especially with Rozenstruik stepping in to replace Dmitry Sosnovskiy on short notice. Will and Beelzebubzy like this. Demian Maia down to -150 vs Lyman Good on 5dimes? Hell yeah, I'll bite at that price, 6 units to win 4 units. Vaughany and omalley21 like this. 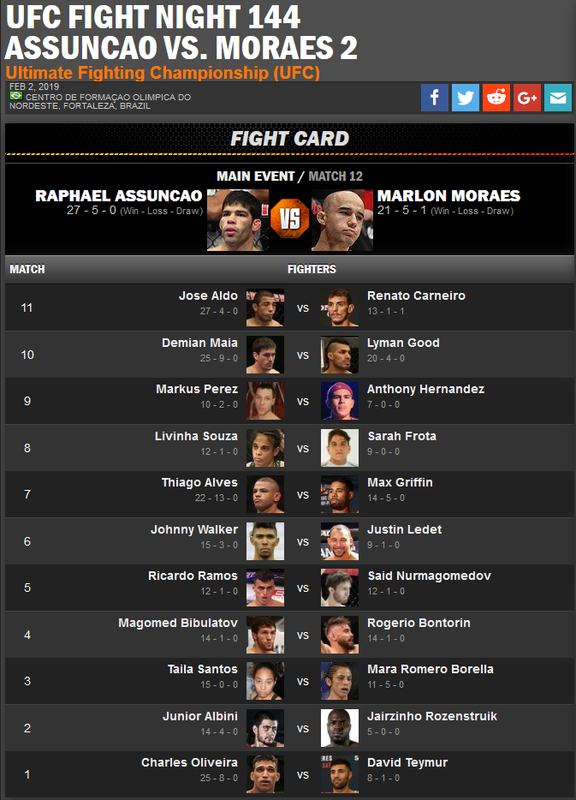 Totals are out: I took Albini/Rozenstruik Under 1½ +110, Maia/Good Under 1½ +130. Moicano down to -135, I had to bet 5.4 units to win 4 units. Aldo has been talking a lot about retirement and the size difference is significant as well. First time ive heard mic cageside. The charisma he shows on his podcast isnt coming through just yet but its early days. If anyone hasnt checked out his podcast. Check it out, "Believe you Me" Its great. I wouldnt be surprised if he gets SJW'd off ESPN with some of the topics they cover. 5dimes has live betting for prelims. Looking to live bet Ledet here. Looking to livebet Mores after rd 1.